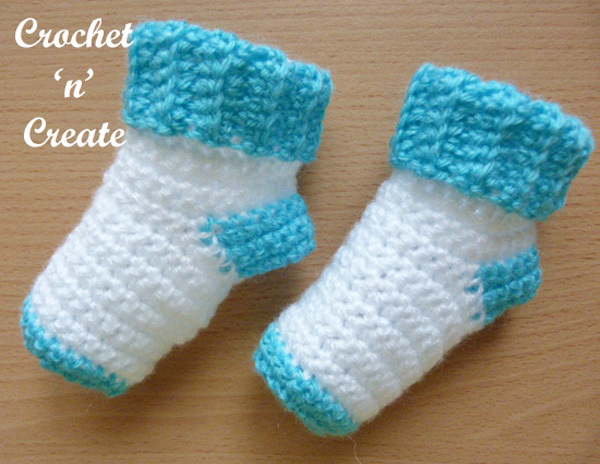 Easy baby socks crochet pattern, worked from the cuff downwards. 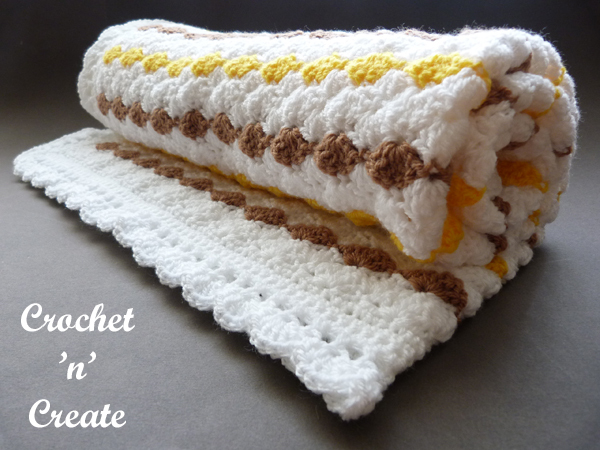 Keep babies feet warm and cosy, they take very little yarn to make and can be crocheted in a short amount of time. 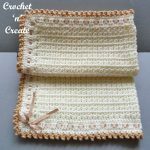 This entry was posted in Baby crochet pattern, crochet baby footwear and tagged baby crochet patterns, crochet, crochet booties, free baby crochet pattern on 2nd October 2017 by crochetncreate. 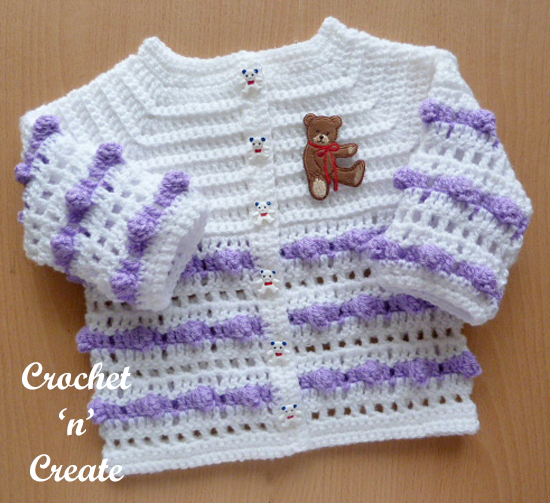 Sweet popcorn baby coat, it can be made for either a boy or girl, made from the neck downwards in one piece this little coat it is easy and quick to make, I have adorned it with teddy bear buttons and a bear applique. It has been designed to fit a 3-6 month baby, hope you enjoy! 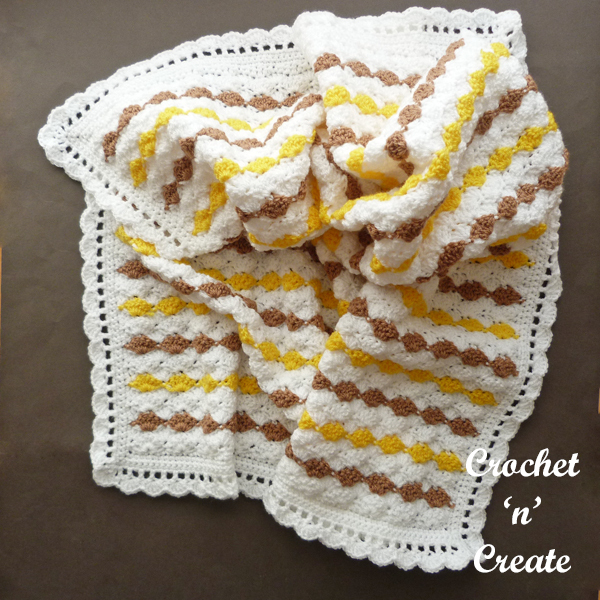 This entry was posted in Baby crochet pattern, free crochet patterns and tagged baby crochet cardigan, crochet, crochet baby sweater, free baby crochet pattern on 15th September 2017 by crochetncreate. This is the woodland newborn beanie uk format version. 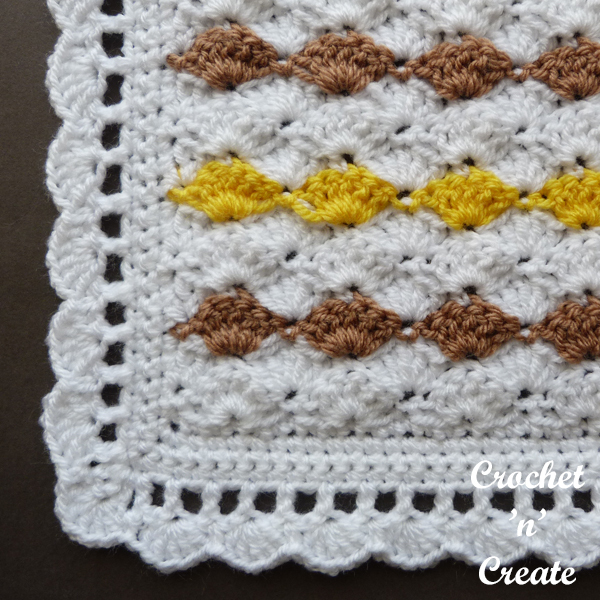 It a part of a 4 piece set, see my free patterns for Woodland Coat, Dress & Booties. Insert hook into next dc, pull up loop, (twice) yrh pull through all loops. Rows 6–12 – 2ch, 1tr into base of 2ch, 1tr into each tr to end, miss 2ch to turn with, ss to first tr on beginning of row. Turn. Brim – Working into back loop only, work 1ch, 1dc into base of 1ch, 1dc into each dc to end, ss to first dc on beginning of row. Turn. Next Row – 1ch, 1dc into base of 1ch, * 1tr into next dc, 1dc into next dc, * rpt from * to * to last dc, 1tr into last dc, ss to first dc on beginning of row. Turn. Pattern Row 1 – 1ch, 1dc into base of 1ch, 1dc into each tr and dc to end, ss to first dc on beginning of row. Turn. Pattern Row 2 – 1ch, 1dc into base of 1ch, * 1tr into next dc, 1dc into next dc, * rpt from * to * to last dc, 1tr into last dc, ss to first dc on beginning of row. Turn. Rpt Pattern Rows 1 & 2 once more in colour 1 and once more in colour 2. Fasten off. 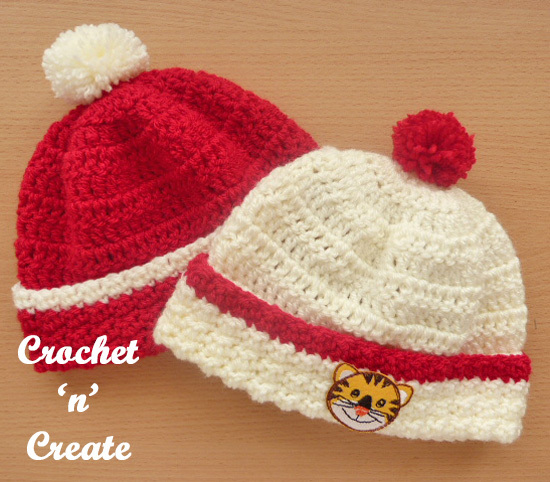 Hope you have fun making the woodland newborn beanie uk crochet pattern. 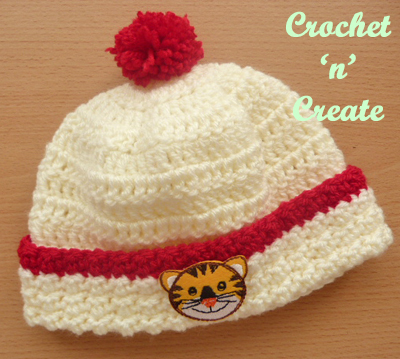 The written instructions and pictures for this woodland newborn beanie uk pattern are copyrighted to crochet ‘n’ create © 2017. 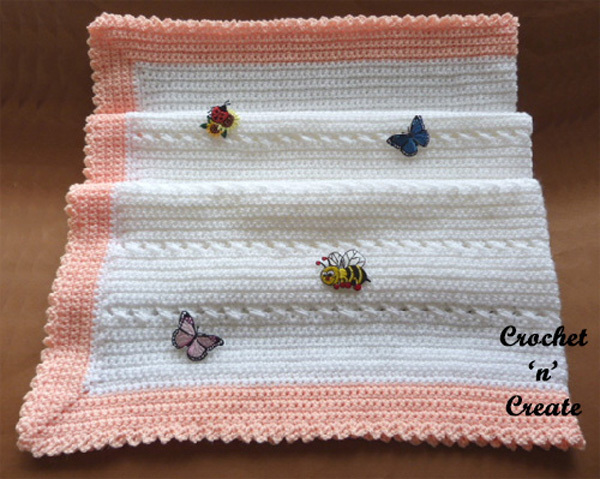 You are welcome to sell the finished products made from the free crochet woodland newborn beanie uk pattern, I just ask that you use your own pictures and put a link back to crochet ‘n’ create. If you wish to share this crochet woodland newborn beanie uk pattern on social media or your blog please only use a direct link to the pattern page on crochet ‘n’ create. 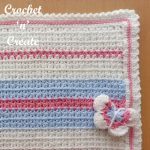 This entry was posted in Baby crochet pattern, free crochet patterns and tagged baby crochet patterns, baby girl, crochet, free baby crochet pattern on 25th August 2017 by crochetncreate. 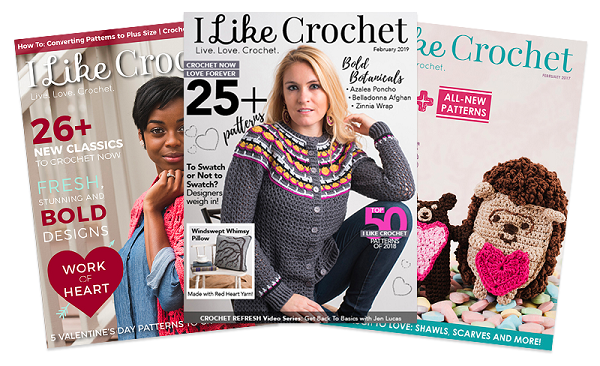 This baby sweater-cardi round up has 7 adorable free cute designs for you to crochet, perfect to slip on when the days are cooler or when dressing up for that special party. 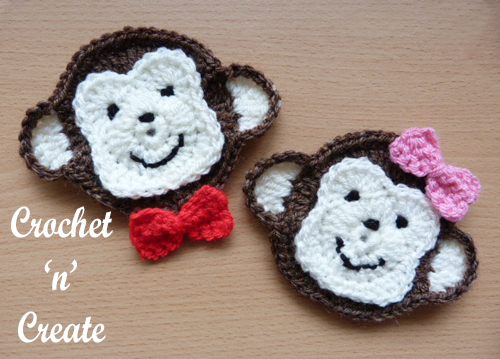 They are also a lovely item for you to gift at baby showers, birthdays etc. or even to make for children’s charities. 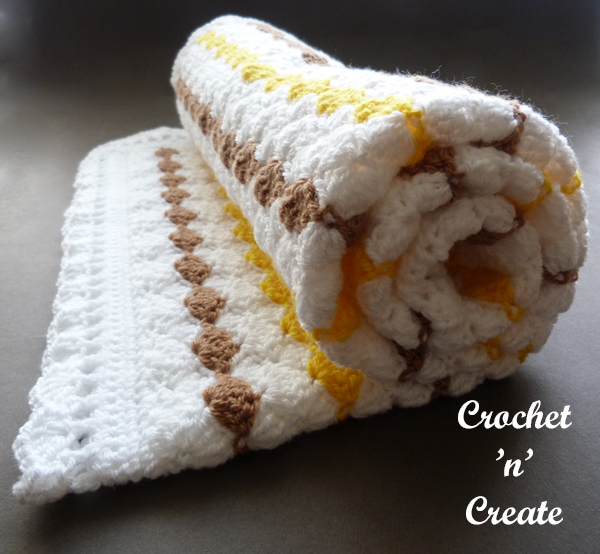 Whatever you decide to make them for I’m sure you will enjoy crocheting them. 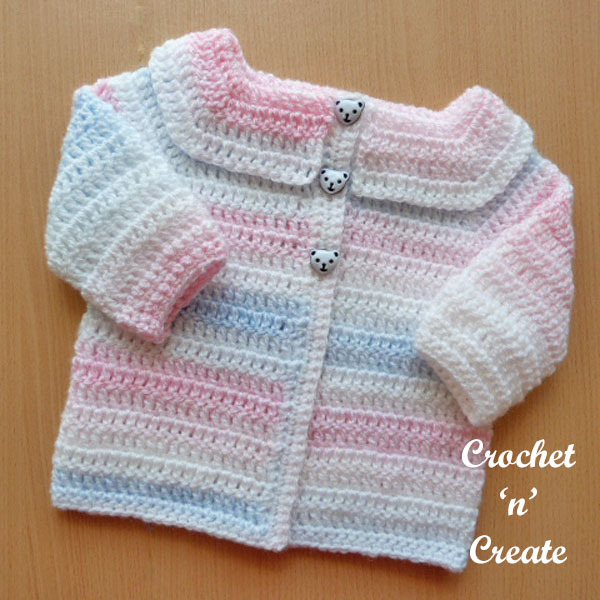 This entry was posted in Free Crochet Pattern Finds, Round Ups and tagged baby crochet cardigan, baby crochet sweater, crochet, free baby crochet pattern on 6th May 2017 by crochetncreate. 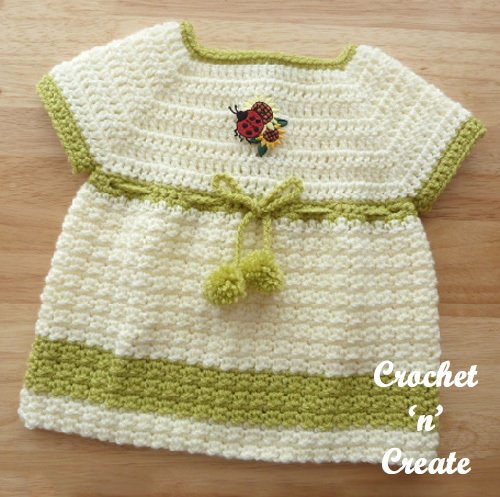 Woodland baby dress, a sweet little dress made in worsted weight yarn to fit a newborn baby girl. 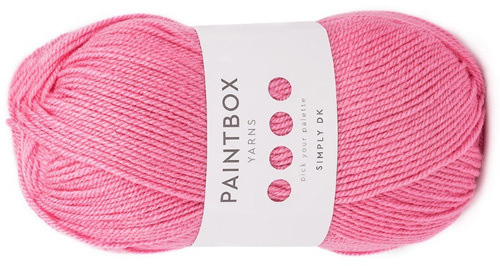 it will look lovely on it’s own or as it is an addition to my woodland collection. 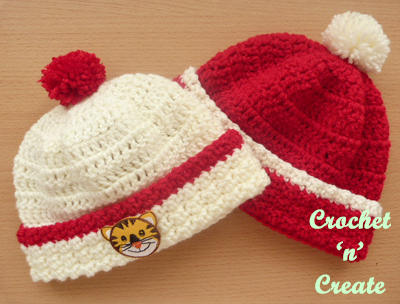 It can be paired with the matching coat pattern or you could crochet the beanie hat and booties to complete the outfit. The dress has the usual features of pom-pom’s and ties. I hope you enjoy. 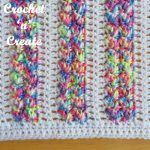 This entry was posted in Baby crochet pattern, free crochet patterns and tagged baby girl crochet, crochet, crochet baby dress, free baby crochet pattern on 4th May 2017 by crochetncreate. 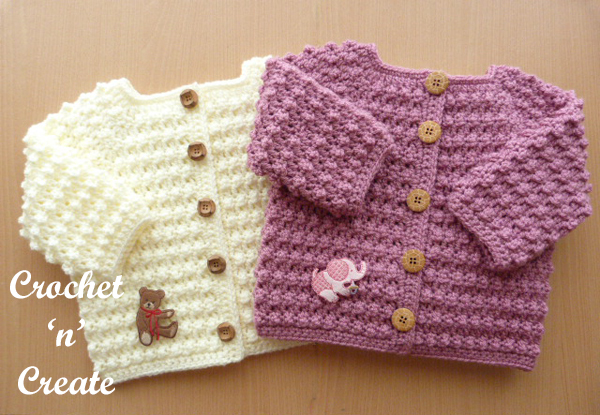 An easy peasy baby cardigan, suitable for the beginner crocheter. 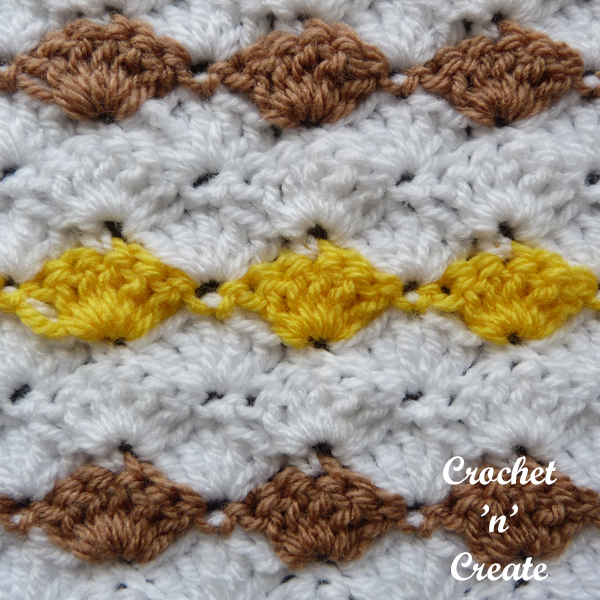 You will love the quickness and ease of this long sleeve free crochet pattern. 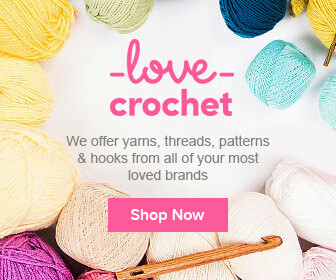 It’s made in a variegated yarn to give it some style with double and single crochet stitches, there is no need for any sewing up as it is worked in one piece from the neck down. Make with or without the collar, once started you will have it finished in just a few hours. 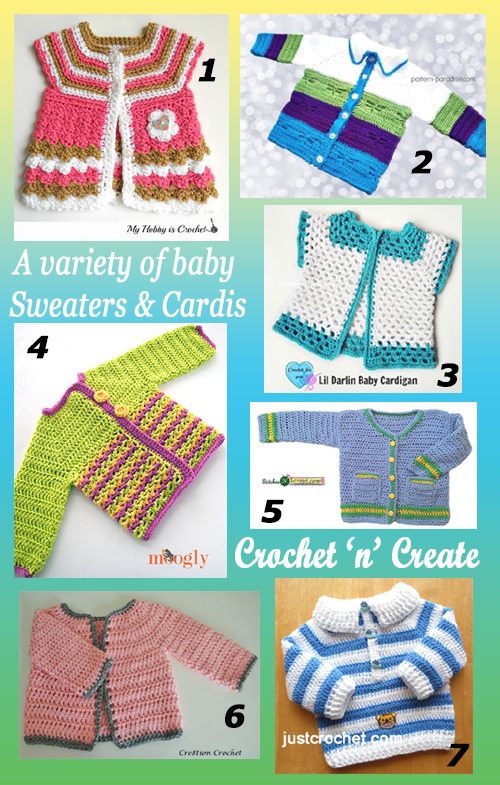 This entry was posted in Baby crochet pattern, free crochet patterns and tagged baby crochet cardigan, baby crochet patterns, baby crochet sweater, free baby crochet pattern on 27th April 2017 by crochetncreate. 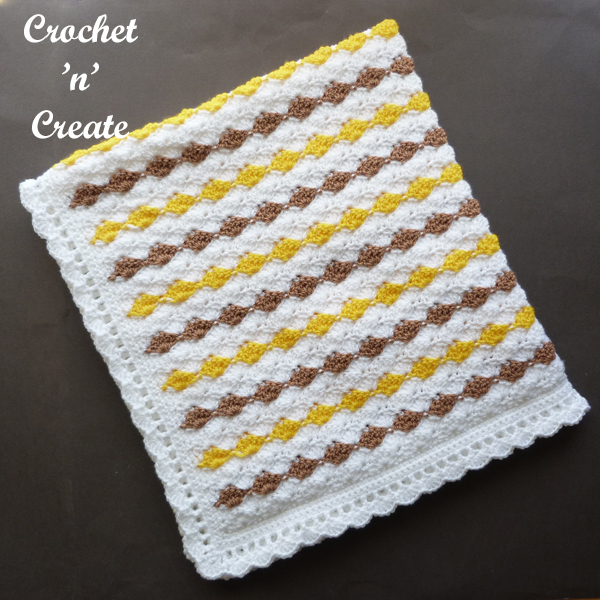 This crisscross baby blanket is simple and easy to make, it features a 2 stitch crochet pattern and is an addition to my crisscross collection. 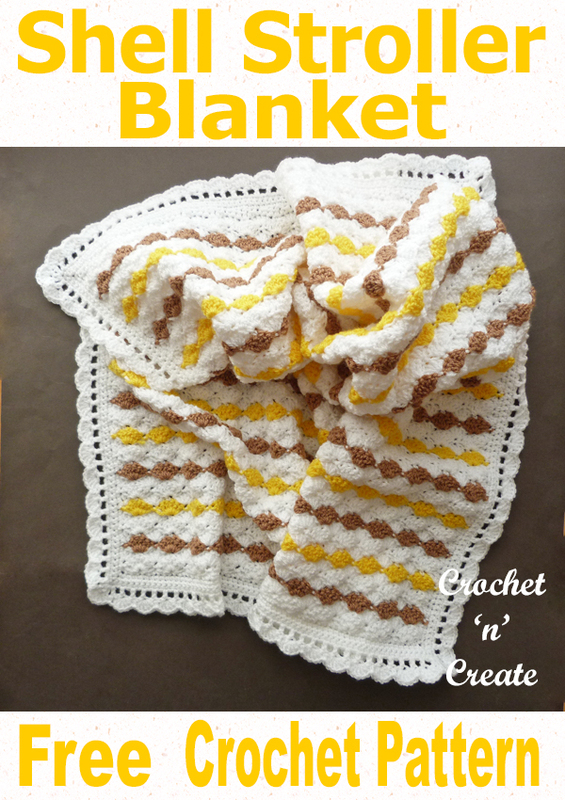 This entry was posted in Baby crochet pattern, crochet blanket, free crochet patterns and tagged baby crochet blanket, crochet, Crochet Shawl, free baby crochet pattern on 18th April 2017 by crochetncreate.